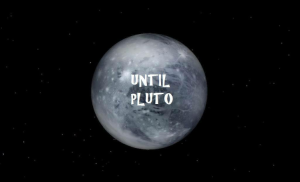 Until Pluto are a sketch writing duo consisting of Patric Ciervo and Pete Gerbron. All of their shows are made up of sketches that exist in the same world. Their first show “Bill Melchior Is Dead”, a who-done-it, mystery show, was performed at the Philly Improv Theater in July 2015. Their second show, “…Still Not A Better World” an alternate history sketch show, was first performed at Philly SketchFest Presents December 2015. Both shows featured performances by other Philly-based comedians. In 2016, they started working on a duo show which they performed at The Peoples Improv Theater in New York City. Patric is the writer for ‘Patric Writes Sketches’ and occasionally performs in his own material. Pete has performed in ‘Patric Writes sketches’ as an actor as well as in the improv group ‘Lover of Books’ and the duo ‘Pete and Kayleigh’.